Only this romantic gift of roses can speak the depth of your admiration and adoration for the lady of your dream! 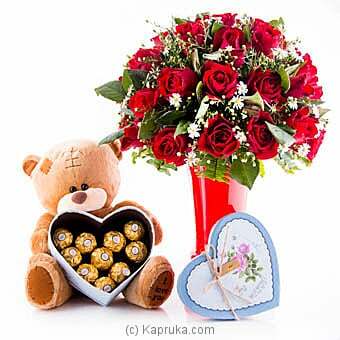 This beautiful arrangement is contains of 30 red roses , white Micheal and 10 piece Ferrero Rocher Chocolates with cuddly soft toy. Note : Color of the chocolate box may slightly differ upon availability.